Diamonds Examiner / Uncategorized / Buy diamonds online? 4 reasons and 10 tips to buy diamonds online! Wondering if you should buy your next diamond(s) online? Here are 4 reasons and 10 tips why you shouldn’t be scared to buy diamonds online! When it comes to picking out diamonds, you obviously want to know what you’re getting. You might think the only way to ensure you’re buying a quality, price-appropriate diamond is to purchase it in store or in person, but this is not true anymore. Shopping for diamonds online can be a wonderful way to ensure you’re getting exactly what you want. If you’re worry about online diamond shopping, I understand – but you’ve come to the right places. Here’s a list of reasons why shopping for diamonds online is the ultimate way to purchase the perfect gem! Check out the reasons below – you’ll be shopping online for your diamond in no time. Not that it would be impossible to find exactly what you’re looking for in person, but it certainly is harder. Think about it – if one store doesn’t have the exact cut you’re looking for, then another store across town might, but then that store might not have the cut you want, but another store in a different city might have that diamond, but then they might have the diamond with the clarity you want – do you see how this could be a lengthy process? With online shopping, you can search with the click of a mouse, never leaving the comfort of your home. In addition to that, with online searches, you can use filters and specific search queries to only show you the diamonds you desire – the exact cut, the exact color, the exact clarity in every search, making your hunt that much easier! When you buy a diamond online, you have the luxury of searching for the right diamond, and researching what you really want, at your own pace. You can cross-reference with the knowledge you’re gaining with a ton of sites, and make sure you’re ticking all the boxes on things you want in a diamond. Online vendors typically don’t have the bias that physical vendors do as well – though they may be getting paid by specific vendors to push their diamonds, they don’t have any specific reason to recommend one diamond over the other unless it’s the better choice. This is the opposite for physical retailers – the more undesirable a diamond, the more they need to sell it to get it out of the store. You can certainly find a good steal at a physical store, but often, you might fall into a sales trap and end up spending more money than initially intended. I have nothing against a diamond salesman doing what he’s supposed to, but it’s hard to deny that the pressure from a seller is present when you’re searching for a diamond in a physical store. I don’t blame them, either. It’s well known that retailers run a store on 40-50 percent gross margins, have expenses, and need to cover their costs, so selling diamonds is crucial – but that pressure shouldn’t be hanging over you while you attempt to make a very serious decision. Online, that pressure is practically non-existent. You can shop, research, and purchase at your own pace without the pressure of a salesman breathing down your neck trying to make commission. This sort of falls in line with our initial point about searching and researching online, but I really want to drive this home. Buying a diamond is a big decision – often, it’s going to cost you a decent amount of money, and you want to make sure you’re getting exactly what you want. But if you’re not sure what you want, you want the freedom to compare, contrast, and learn while looking for diamonds without feeling the immense pressure to purchase, or worry about wasting time. Ultimately, you want to walk out of a purchasing a diamond on your own terms, not on someone else’s. When you shop online for a diamond, you have the time to research, you can side-by-side compare and contrast instantly, and the luxury of picking out exactly what you’re looking for without ever leaving home. So, you’re interested in shopping online for a diamond? That’s perfect! I think it’s a fantastic way to find exactly what you’re looking for. Before you get to clicking though, there’s a few things I should talk about before you purchase. Check out the ten tips below for buying your diamond online! It goes without saying that you should never purchase something you don’t know anything about – this is especially true with diamonds. First, you have to research your options. Make sure you’ve educated yourself on the 4c’s (color grade, carat weight, clarity grade, and cut grade) and ensure that the diamond you’re looking at meets all those criteria. Decide which of these are the most important to you, then begin to form your hunt off of those specifics. 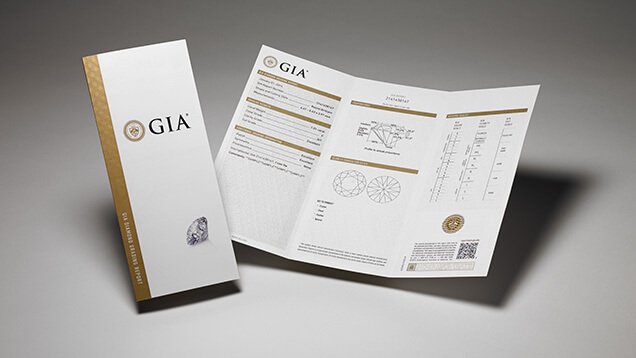 Before you even consider purchasing a diamond, it’s imperative you check that it comes with an independent grading report, like those provided by the GIA, IGI, GSI, AGS or HRD. This is an unbiased report and analysis on the diamonds 4c’s. Because a diamonds value is determined by quality, you want someone to assess the diamond that has an unbiased opinion on it, in other words, who has no dog in the fight for selling it to you like a diamond salesman would. So, the diamond came with a grading report from a famous laboratory? Perfect. Now, you can verify the details online on each grading laboratory website. These online databases have all the information you need to make sure that the online product description of your diamond matches the grading results in the report. It’s important to know exactly what you’re buying, so specifics have to be priority. Make sure the sites you’re looking at provide the things you need to know. Are the 4c’s discussed on the site? Do they show you a range, or do they have specific numbers? Always look for specific, particular characteristics in your diamond information. Not all diamonds will have this, but for added security, check and see if the diamond’s grading report number is lasered into the girdle of the diamond. Sometimes, the diamond will be inscribed before it goes up for sale, or you can request it be inscribed when you purchase the diamond. This inscription is microscopic and will only be seen under 10x magnification using a jeweler’s loupe, so it won’t mess with the diamonds appearance. 6. Are you comfortable with the payment method? This one should probably go without saying, but if you feel funny about the payment method the online vendor is requesting, the diamond should be a no-go. Don’t just consider the safety of the site – though that should be your primary concern – think about how you want to pay as well, as some sites will be specific. If you want to use a credit card, make sure the site you’re choosing allows it. A check or money order? Check on that as well. Even if you don’t personally know the seller, there’s plenty of information you can try to find that can help you build an identity on the seller. If you’ve decided to narrow it down to one vendor, make sure you can find the correct information about them. Do they offer secure transactions? What does their return policy look like? Where are they located – in country or out of country? How do they plan to ship your diamond? Have they been in the diamond business for a long time? Make sure you find answers to every question, and don’t forget to read all the feedback and reviews on their site, and other sites that discuss that specific seller. Once your diamond is in your possession, find an independent appraiser that confirms all the information you have on the diamond. The appraiser should provide you with an accurate value of your diamond, as well as help you verify all the information, so you can get the diamond properly insured. These sorts of transactions require extra caution. U.S. based consumers typically will have options for recourse with same-country vendors, but sometimes, you won’t have those same options with out of country vendors. Some websites that don’t have a physical presence in your home country may not allow you to recover your funds if need be. Listen, I love the convenience of online shopping and purchasing of diamonds, but when it comes down to it, you want to make sure your diamond is good-to-go in person before purchase. Seeing the diamond with your own eyes is the best way to make your decision, so make sure that you’re able to purchase from a seller with a flexible and easy return policy. 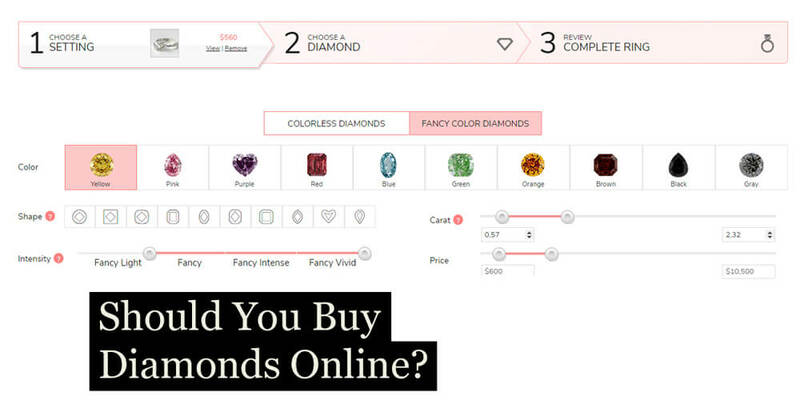 Where Should You Buy Your Online Diamond? Now that you’re getting more comfortable with the idea of shopping for and purchasing a diamond, it’s important to be careful about where you plan to buy your online diamond. Remember that internet-only jewelers can offer you cheap deals because they help you avoid the overhead that’s associated with running a physical shop. Ensure that whichever online shop you’re buying from has a good reputation, as well as authentic reviews, and a lot of them. The more information on your online diamond shop, the better. As always, too, make sure you can verify the online information you’re getting. Buying a diamond in person can often cost you much more cash than you’re willing to spend, so check the online-only stores, verify your information, and get to shopping!